H. Rick Bamman - hbamman@shawmedia.com Thyroid cancer survivor and cancer fighter ambassador for the Cancer Treatment Centers of America Gary Hackney knows what life is like for a cancer patient. 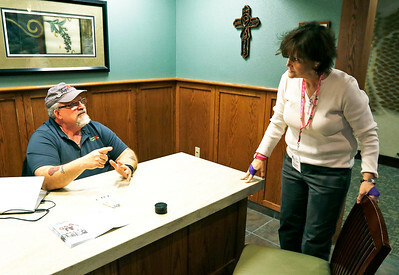 A few times a week the McHenry resident drives to Zion to talk to patients and their families. H. Rick Bamman - hbamman@shawmedia.com Gary Hackney knows what life is like for a cancer patient. A thyroid cancer survivor, the McHenry resident works as a cancer fighter ambassador for the Cancer Treatment Centers of America. He drives to Zion a few times a week to talk to patients including Carla Hocutt of Demopolis, Alabama. H. Rick Bamman - hbamman@shawmedia.com Gary Hackney explains the "Wow" factor for the first time visitors to the Cancer Treatment Centers of America Zion location. "It's more of a resort lobby than a medical facility," Hackney said. Hackney knows what life is like for a cancer patient. A thyroid cancer survivor, the McHenry resident works as a cancer fighter ambassador. He drives to Zion a few times a week to talk to patients and their families. Gary Hackney explains the "Wow" factor for the first time visitors to the Cancer Treatment Centers of America Zion location. 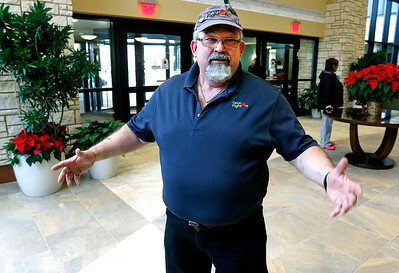 "It's more of a resort lobby than a medical facility," Hackney said. Hackney knows what life is like for a cancer patient. 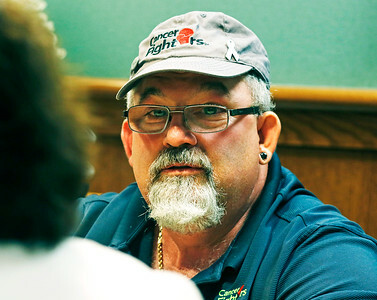 A thyroid cancer survivor, the McHenry resident works as a cancer fighter ambassador. He drives to Zion a few times a week to talk to patients and their families.